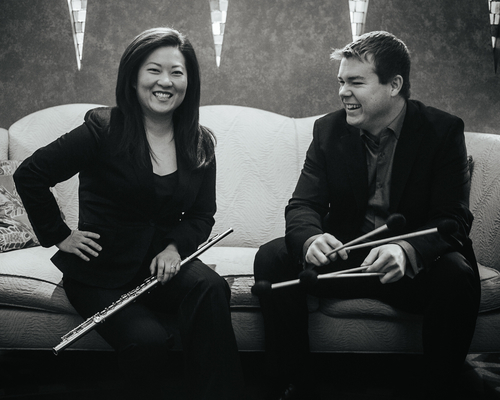 The bi-coastal A/B Duo (flutist Meerenai Shim from the SF Bay and percussionist Chris Jones from Rochester, NY) will premiere new works commissioned from Drew Baker, Ivan Trevino and Matthew Joseph Payne in a cabaret-style setting. Enjoy complimentary drinks and snacks while you listen to the new and surprising works. The program will include: an exciting new piece for flute, percussion and Gameboy (LSDJ) by Bay Area chiptune artist and composer Matthew Joseph Payne, an amazingly inventive and thought-provoking new work by Chicago based composer Drew Baker and an exciting composition by Ivan Trevino, rock-drummer, composer and member of the cello rock band Break of Reality. All these pieces were written especially for A/B Duo in 2013. Come to the Happy Hour, listen to A/B Duo premiere the music, discuss the compositions with the artists and your friends and hang out at the Center for New Music.